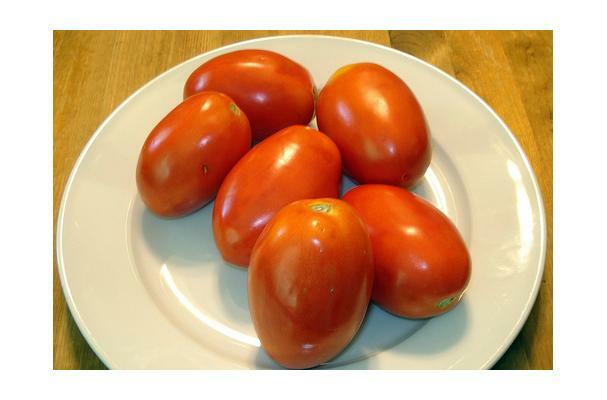 A short, oval-shaped variety of tomato common in Italy and used in making Italian dishes, especially sauces. Their shape makes it especially easy to scoop out the seeds. Resembling grapes. Roma tomatoes are particularly good for cooking, they have fewer seeds and are meatier, and are great for canning and sauces. Small, smooth, usually red in color, acidic, juicy, egg or pear shaped. Choosing: Look for Roma Tomatoes that are nice and red in color, also look for ones that are plump. Heaviness for their size indicates a lot of juice. Buying: To get the best Roma tomatoes, you should go to an open farmer's market, where they are grown fresh and in season during the summer months. Hot-house grown Roma tomatoes are available year-round at most grocers. Procuring: Roma tomatoes are usually grown in warm climates, such as Italy, parts of North America and Mexico. Roma tomatoes make a wonderful tomato sauce. They are meaty and have very few seeds. These tomatoes are normally chopped up into small pieces and sprinkled over small dishes. Cleaning: Always rinse with water to clean and remove any pesticides. Never refrigerate tomatoes. Store in plastic container to keep fresh. In India, Roma tomatoes are used in ceremonial dishes to honor the dead. History: Tomatoes where first documented in Southern and Central America. The Aztecs are known as the first to use tomatoes in cooking. After he invaded Mexico, Cortez brought tomatoes back to Europe where their future as a food source was not immediately obvious. Originally thought to be poisonous, they eventually gained popularity and are now one of the world's favorite foods.